Location between Siam Country Club Road and Soi Nermplabwahn. 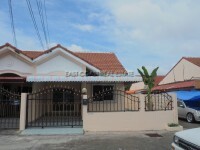 Two storey Townhouse is set on area 19.5 Sq.wah, 3 bedroom and 3 bathrooms. Downstairs of the home is the lounge area, a guest bathroom and fitted western kitchen. Upstairs has 3 bedrooms and 2 bathrooms. The village has 24 hour security and is close to local Thai markets, many convenience stores and restaurants. Title deed is registered in Thai ownership, with land office taxes being spilt 50/50 between buyer and seller.